Visual artist and musician Hal Rammel has been involved in the creative arts for the past 45 years. His work as a visual artist encompasses drawing, sculpture and collage, cartooning, and photography (pinhole and alternative cameraless processes). His work has been shown at the Carnegie Museum of Art (Pittsburg, PA), the Museum of Contemporary Art (Chicago, IL), the Wustum Museum of Fine Art (Racine, WI), Gallery 1926 (Chicago), Woodland Pattern Book Center (Milwaukee), Corbett vs. Dempsey (Chicago), and the John Michael Kohler Arts Center (Sheboygan, WI). His photographs have been reproduced on the covers of compact discs released by Hat Art (Zurich), Penumbra Music (Grafton, WI), and Long Arms (Moscow). His work as a cartoonist has appeared in several volumes including, most recently, Conversations in the Aether (Penumbra Music, 2014). 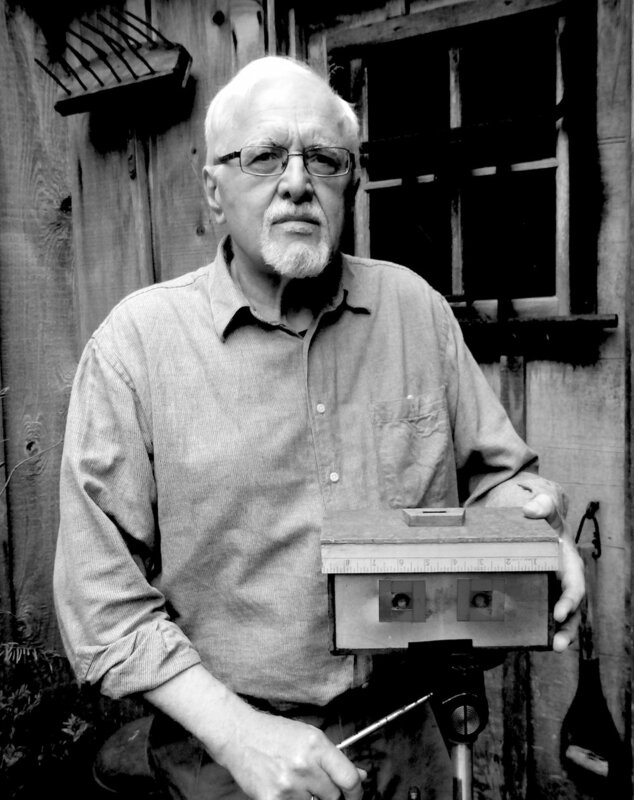 His stereoscopic photographs (including cameraless photograms in 3D) have been included in the 57th Carnegie International and in a one person show at the Cedarburg Art Museum. These large format stereoscopic photos are viewed through a reflecting stereoscope modified by Hal Rammel from Charles Wheatstone’s original designs from the 1830s. As a composer and improviser he utilizes musical instruments of his own design and construction, releasing many recordings on his own label Penumbra Music. During the 1980s he was an active member of Chicago's experimental and improvised music scene performing frequently with Gene Coleman, Michael Zerang, John Corbett, Terri Kapsalis, Lou Mallozzi, Jim Baker, Don Meckley and others. In the 1990s he performed at numerous music festivals in the United States and Canada including the Newfoundland Sound Symposium (in 1996 in duo with Johannes Bergmark), the No Music Festival (in 1998 with the Nihilist Spasm Band), and others. Presently, he performs with Linda Binder in the duo PaVda and with cellist Matt Turner in the duo Fractures & Phantoms. In 2013, fourteen musical instruments designed and built by Hal Rammel were included in the permanent collection of the National Music Museum in Vermillion, SD. These acquisitions include many acoustic instruments built in the early 1990s that figured prominently in his work with Chicago improvisers and in his early recordings on Penumbra Music label. The National Music Museum also acquired four amplified palettes dating from 1997 to 2010. As an author Hal Rammel has written on musical instrument invention for Experimental Musical Instruments, Rubberneck, and Musical Traditions. His full-length study of surrealism and American folklore, Nowhere in America: The Big Rock Candy Mountain and Other Comic Utopias (including discussion of ‘Haywire Mac’ McClintock, Blind Blake, Bo Diddley, Al Capp and the Shmoo, Jack Benny, and Spike Jones and Red Ingle), was published by University of Illinois Press in 1991. His liner note essays have been included with recordings released by Atavistic Records and CRI, most recently for the Unheard Music series reissue of Sun Ra's Strange Strings. As a graphic artist, Hal Rammel has published numerous books of comix and cartoons along with, in the later 70s and early 80s, two chapbooks of pen and ink drawings. Recent publications include Conversations in the Aether, an Aeolian melodrama, an exploration of the visual worlds of 20th century artists such as Paul Klee, Toyen, and Victor Brauner. Hal Rammel curates the Alternating Currents Live performance series at Woodland Pattern Book Center in Milwaukee.